The Freemasons. The Satanic Hell-Fire Club. The Illuminati. 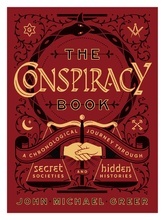 Conspiracies and secret societies continue to fascinate us—and in this compelling compendium, John Michael Greer shines a light on 100 mysterious conspiracies across time, from Ancient Greece to the modern era. Taking us from the fall of the Knights Templar to the revolutionary agendas of France’s Social Circle to Al Capone’s ascent to Capo Dei Capi, The Conspiracy Book ranges from secret societies that planned revolutions to underground groups with nefarious agendas. Illustrated with intriguing photos and ephemera, it’s a must-read for anyone interested in learning more about the hidden forces that have shaped some of the most significant events in history.